There are a lot of different theories on the best cycling nutrition strategies. And there are many companies pushing nutrition ideas that just happen to point toward the wonderful efficacy of their products. What is the Best Cycling Nutrition? It is not a matter of whether downing a certain brand of gels on a ride or drinking whey protein after the ride delivers, for the “average cyclist,” the best results. It really only matters if it works for you. Chances are, that you are not “average.” People’s metabolisms are different, sometimes very different, from one another. For years I rode with a fellow who could be out all day and would barely sip from his bottle. I started to think that he had a bottle in his cage more for show than for thirst. While he occasionally wet his lips, I was downing multiple bottles of any liquid I could get. And I was still a bit dehydrated afterwards. He was at least as strong on the bike as I, and probably had better endurance. What gives? Unlike all the vendors purporting to have the universal “magic powder” drink mix or power bar, I’m willing to bet that if you have been paying attention to your body, you already have a pretty good idea of what works for you. For example, I’ve heard lots of riders explain how they can knock back gels early on a long day out. Later in the day, however, they crave something more substantial, often savoury, not sweet. Sometimes you have to just experiment. It took me years, in fact, to figure out that I needed a lot of salt while I was riding. I tried “electrolyte” tablets and other things, but it was not until I started dropping a teaspoon of salt (!) into every pint of my drink that I noticed the difference… It was a big difference. I went from dragging out the last few miles of long rides and then feeling ill that night, to joining some of the town line sprints at the end. It is with the natural variation of the human metabolism that we have planned the food at the feed stations in Grassington, Hawes, and Airton. 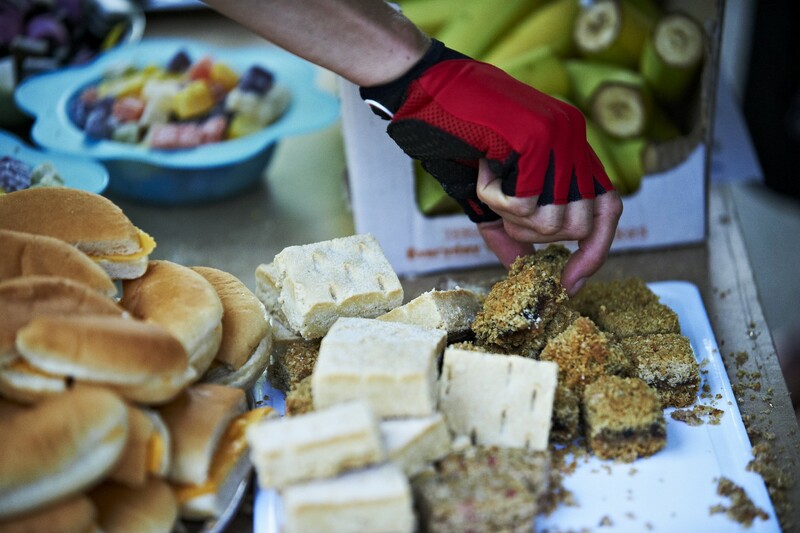 There is a big stock of real food, not just the cookie-cutter, quickie cyclist snacks found on most sportives. There are sweet and savoury items. We have a lot of good baked goods, including bake-wells, danish pastries, and home-made sandwiches. Really, home-made… see the video above of making 1000 sandwiches for the 2017 White Rose Classic. And fruit, particularly bananas. And some gels, sweets, and crisps. You can grab what suits you. Listen to your stomach, then open our mouth and indulge in exactly what makes you feel right for the ride home!